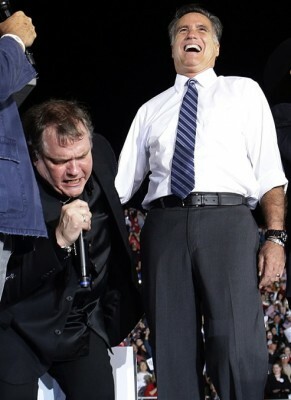 The fat lady has sung, or in this case, the fat drunken has-been rock star known as Meatloaf has sung, finally crippling one of the crookedest-run Presidential campaigns in Republican history, that of Mr. Romney. It seemed that Ted Nugent’s remarks earlier this year at an NRA convention where he ranted about not being around if Obama gets a second term would have sunk the candidate, but it didn’t. Then came Clint Eastwood, who seemed to be the only person who thought it would be amusing to talk to an empty chair at the Republican National Convention. Crazy? Maybe, but not near crazy enough to change people’s minds about voting for Romney, except for Eastwood’s daughter, who has publicly voiced her support for Obama. But now, this week, Meatloaf has finally brought the celebrity crazy house down by maniacally screaming out his hallelujah version of America the Beautiful at a Romney rally in Defiance, Ohio. “It was a gin-soaked performance by a washed up musician who obviously didn’t realize he would be forever known not as the guy who made an unpopular Monday night dinner a popular diner staple, but the guy who brought down the Romney campaign,” said Anderson Cooper as he began his 360 show on CNN. 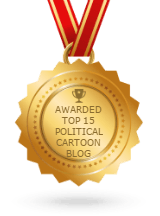 After watching the performance on YouTube, a fed up Paul Ryan is said to have called Sarah Palin to tell her she wins, the Vice Presidency is hers…again. Meanwhile, Mitt Romney left the stage with what little dignity he had left and immediately called Donald Trump.